"It is amazing, absolutely incredible! I can’t believe it! For me it was a dream to win a stage at the Tour de France. And now this dream came true. Last year I won a stage at the Giro and now I repeat my success at the Tour. Already yesterday I felt quite good and today I was motivated to go in a breakaway, to try to fight for the stage. I knew it would be difficult, especially because the group was really big. "On the final climb, there was some head wind, but I found a moment for an attack and just did my best to catch Stuyven to lead the race, and to hold my advantage until the finish line. This victory is so important for me, but also for my family and my friends. We were wearing black ribbons today to honor Denis Ten. It’s a very sad story for the whole world of sport, that’s why I dedicate this victory to all the people of Kazakhstan," said a very happy Omar Fraile after the finish. In the 188-kilometer-long stage from Saint-Paul-Trois-Chateaux to Mende, it was up to the breakaway. A group of 32 riders took off, gaining an advantage of almost 10 minutes on the peloton. Before the final climb, Jasper Stuyven attacked. With almost 2 minutes advantage he started his climb on the Cote de la Croix Neuve. Omar Fraile attacked just after the breakaway group started on the final challenge of the day, and he was able to catch Stuyven just before the top. From there, he sprinted to his stage victory at the airport of Mende, just in front of Julian Alaphilippe and Jasper Stuyven. Behind the breakaway, there was an interesting fight for the general classification going on, with Jakob Fuglsang finishing in one of the first groups. He moved from the tenth to a ninth place in the GC. Tomorrow the riders will face a stage of 181.5 kilometers, from Millau to Carcasonne. A stage with three climbs, of which Pic de Nore (1st cat.) will be the final one before the riders hit the descent towards the finish in Carcasonne. 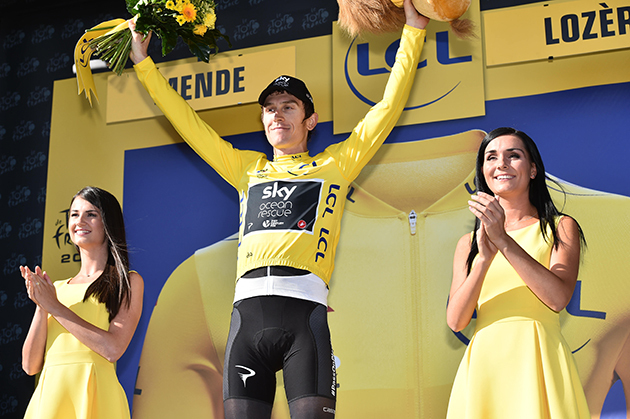 Geraint Thomas and Chris Froome retained their 1-2 grip at the top of the general classification after finishing together on stage 14 at the Tour de France. The Team Sky duo crossed the line on the Mende Aerodrome alongside nearest rival Tom Dumoulin (Team Sunweb), with the race’s top three remaining in lockstep. The Cote de la Croix Neuve provided the big test of the day and after Team Sky set a pace on the climb through Michal Kwiatkowski and Egan Bernal only a select few contenders remained. Both Thomas and Froome put in accelerations in a bid to distance Dumoulin, who remains 1:50 behind the yellow jersey, and just 11 back on second place. Bernal again impressed, with the youngest rider in the race setting a fierce tempo, which at one point looked to have briefly put Dumoulin into difficulty. Luke Rowe and Gianni Moscon combined superbly to shoulder the pace-setting for the vast majority of the 188km test, gradually letting the gap to the a 32-man escape slide out. 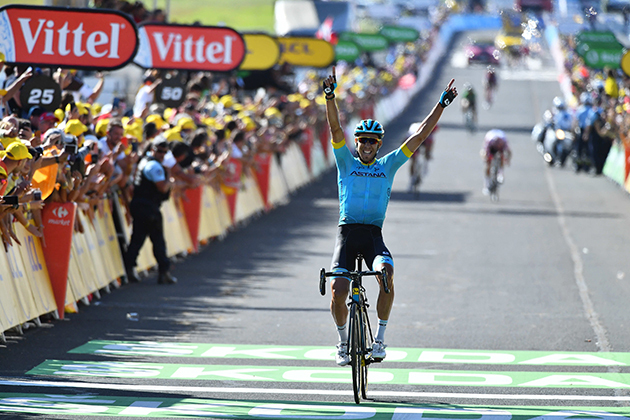 The stage had always looked destined to go to the breakaway and so it proved, with Omar Fraile (Astana) emerging victorious, six seconds ahead of Julian Alaphilippe (Quick-Step Floors), and some 18 minutes ahead of the yellow jersey battle. After the race Thomas explained: “We were happy for the break to stay away. There were a lot of guys up the road but Luke and Gianni rode really well, riding within themselves really and just let the gap steadily go out. Obviously we knew it would split up at the finish, and with only two mountaintop (finishes) left that the guys would try. We’re satisfied. Obviously Roglic got a bit of time back but it wasn’t too much of a stress for us. It's nice to gain a bit of time on everyone else. Earlier the combination of a battle to get into the break and lots of wind saw echelon racing right from the off, with the peloton split into four groups as it left Saint-Paul-Trois-Chateaux. The situation eventually calmed with a sizeable break pushing on up the road. The day was controlled well by the team, with only Primoz Roglic (LottoNL-Jumbo) edging out eight seconds in the GC battle. As soon as the flag dropped on the 14th stage of the Tour de France, the pace was on with crosswinds immediately causing four distinct echelons to form. 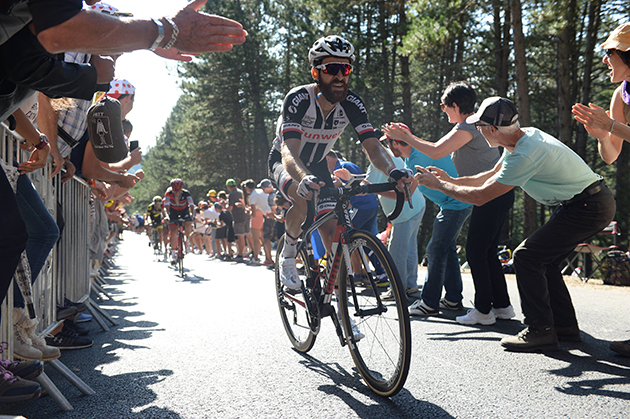 In the midst of the action a seven rider group managed to breakaway, with a larger group including Simon Geschke chasing. The two groups came together, opening up an enormous 19 minute advantage over the peloton by the time the final kilometres neared. Attacks from the group, including efforts from Simon, saw numerous riders go forward with one ultimately taking the win solo. With riders all across the road after the accelerations fractured the group, Simon crossed the line in a solid 6th place. Some distance behind the breakaway, the GC battle began as they approached the final climb. Going into the climb in a good position, Tom had Søren Kragh Andersen for company, pacing him up the initial kilometres of the ascent. As the group reduced, Tom was momentarily distanced but continued to pace his way up the climb. As soon as he closed the gap he immediately put in his own attack, but the other GC contenders remained close on his wheel. It came down to a battle between the top three in the GC, with the trio jumping ahead of the rest of the group of favourites, but all were unable to shake one another off. They crossed the line all together with no changes to the GC podium places after stage 14. While the Tour de France currently sat between the Alps and the Pyrenees, this wasn’t to say the climbing was over for the time being. There were some taxing ascents to deal with on today’s stage, with the Côte de la Croix Neuve capping off the day – a 3km ascent with an average gradient of 10.2% to show the riders the climbing is far from finished. After joining the escape and collecting the full 20 points in the intermediate sprint, the UCI World Champion, Peter Sagan, stuck with the break to make it a day on the front, staying in contention on the final climb and surprising his breakaway companions by taking fourth on the line, proving the Slovak rider can perform on any terrain when there are points up for grabs. The Tour de France road book classed this stage as “hilly” and that was certainly the case. The 188km parcours would see riders cross three categorised climbs before the final ascent to the finale. After the intermediate sprint at 90km, the road would steadily work its way upwards before undulating its way to a welcome descent at 162km, before the last climb of the day – the Côte de la Croix Neuve. It wasn’t quite a summit finish, as the day would end 1.5km after the top, but it would be weighing heavy on the minds of the peloton the whole day. Classed as a second category climb, the Croix Neuve was much harder than its category would suggest. At 3km long, it was short, but the average gradient was 10.2% and riders would be pushed into the red from the very first pedal stroke. With more than a kilometre still to ride once they’d crested the climb, there would be no gentle coast to the line – whoever wanted to take the stage win would have to go even deeper to beat their rivals. Not quite a day for the climbers, nor for the all-rounders, the day could be taken by almost anyone. While there were some challenging climbs later in the day, the early sections of the race would see some exposed terrain, meaning splits were possible due to crosswinds. Being caught out here could mean sitting in the peloton the rest of the day. The main aim here would be to be ready for the splits and to make the most of them to put some distance between the challengers for the stage. With the terrain at the finish suiting either Gregor Mühlberger or Rafał Majka, the aim would be to try to get them in position, but if not, there were points available at the intermediate sprint, and Peter Sagan would be aiming to make the most of these if the chance was there. A lot would depend on who made it into the break – with the team riding either to support them, or to work with the peloton to draw in the break at the end of the day if nobody had made the jump. Helped along by the crosswinds forming echelons in the early kilometres, a huge group managed to escape today. At first count, there were thirty-two riders up front, and among them were the UCI World Champion, Peter Sagan, and his BORA-hansgrohe teammate, Maciej Bodnar. This group had some strong riders in it, the gap rising as the day went on, and by the time the escapees approached the intermediate sprint at 90km, this gap was up to seven minutes. Supported by Maciej as his lead-out man, Peter raced ahead and took the full 20 points, further adding to his massive lead in the Maillot Vert contest. Having hit the 80km to go mark, and when the group was hitting the foothills of the day’s big climbs, the more ambitious riders from the break started attacking and gaining more time, with the race splitting into pieces ahead of the peloton. With the main bunch more than eighteen minutes back with 15km to go, it looked certain that the break would have their day today. A solo rider off the front took the stage, but it was Peter who surprised the rest of the breakaway by coming across the finish line as the first of the chasers, taking fourth spot and adding yet more points to his Green Jersey total. On a ride where most would be satisfied with a top ten position, the Slovak rider, after comfortably summiting the climb, had actually decided to push on for the win - a move that would sound crazy from any other rider but Peter. 21 July, 2018, Mende (FRA): Damiano Caruso led the way for BMC Racing Team in the closing stages of stage 14, battling to fifth on the line after spending a day at the front of the race alongside teammates, Stefan Küng and Greg Van Avermaet. Stage 14 saw the Tour de France enter the Massif Central region of France and featured four categorized climbs including a punchy final 3km ascent, with an average gradient of over 10%, up to the finish on the airport runway in Mende. Crosswinds in an exposed section of road less than 10km into the 188km stage caused early havoc on the road with the peloton split into at least four echelons and in the midst of this excitement, seven riders were able to jump off the front and go clear at the head of the race. A handful of kilometers later, the main bunch appeared to be settling down behind the initial breakaway while in between a large group of 25 riders, including Caruso, Küng, and Van Avermaet, was working hard to bridge the gap to the leaders. The now 32-rider breakaway was able to extend its advantage out to almost five minutes after 45km of racing and the gap continued to grow with race leader, Geraint Thomas' Team Sky teammates controlling the pace behind. On the day's first climb, the Côte de Grand Châtaignier, the large front group with Caruso, Küng and Van Avermaet was sitting 6'40" ahead of the peloton and by the time the race reached the Col de la Croix de Berthel the deficit had extended once again and was hovering around the ten-minute mark. It was on this climb that riders started to attack off the front of the breakaway with Gorka Izaguirre (Bahrain Merida Pro Cycling Tem) opening up a narrow advantage over the rest of the leaders before being joined by Tom Jelte Slagter (Team Dimension Data) and Jasper Stuyven (Trek-Segafredo) on the descent towards the Col du Pont sans Eau. The trio was 45 seconds up the road at the summit of the penultimate categorized climb while behind, BMC Racing Team's three riders continued to work hard in what was left of the breakaway and with the peloton another 14 minutes back, and the gap only continuing to grow, it looked certain that the battle for the stage win would be fought out between the riders in front. After the KOM, the road continued to rise and as a result the chasing group began to splinter with Küng, who put in a lot of work at the front of the breakaway for the majority of the stage, losing contact as Caruso and Van Avermaet pushed on alongside 17 other riders 1'30" behind Stuyven, who was going solo with 20km to go. The lone leader hit the bottom of the brutal ascent to the finish line, the Côte de la Croix Neuve, with an advantage of 1'40" but as the steep slopes began to take their toll and the chasers began to attack one another, the gap fell quickly. In the end, Omar Fraile (Astana Pro Team) passed Stuyven just passed the 2km to go mark and he was then able to hold onto a narrow advantage to take the stage win ahead of Julian Alaphilippe (Quick-Step Floors) and Stuyven. Caruso continued to ride his own race behind Fraile and dug deep in the closing kilometres of the day to secure fifth on the line, and move up to 17th overall, after another strong performance at the front of the race. Küng and Van Avermaet also looked in good form throughout the stage with the pair finishing 17th and 20th respectively while, the first of the General Classification riders came across the line 18 minutes back. Unfortunately Patrick Bevin was forced to abandon the Tour de France in the second half of stage 14 today after battling through ongoing gastrointestinal issues. "This morning it was in the program that we wanted try and go in the breakaway. In the end, we went really fast in the first 10km of the stage and with crosswinds it was really chaotic. Then, me, Stefan and Greg were able to make it into the big breakaway. It was 'à bloc' all day up and down, left and right and then the last climb was really short and steep. So, for me, it was like a TT because I went full gas from the bottom to the finish and in the end, I was fifth but I was hoping for a podium finish maybe." "The goal now will be to try again in the next few days. I am feeling really good. I worked hard to be ready for this race and today, I was able to show once again that my condition is good and I will keep trying." "It was a super hard stage. It was a long day and always up and down. In the end, I knew already that I didn't have the legs to go for the victory or a nice result. I just rode my tempo because it was a super hard day and it has been a super hard week. I have good legs but they are not so fresh anymore." "We tried at the front but I have to say that we knew that Alaphilippe was one of the big favorites for this kind of finish and that it would be really hard for Stuyven on the last climb. If you see how steep it was, I think you could have had even two minutes and it would still have been hard to stay in front. So, we did our job and no more than that as we don't want to give the victory away." "It was pretty hard to make the breakaway. I was already up there in wind and then it was always slightly uphill so it was pretty hard to even get in there in the first place. We were all rolling through so the breakaway was collaborating pretty well. I was feeling quite ok but you also feel that it's the second week in the Tour, stage 14. So, for sure the race has already taken its toll. I think everybody had tired legs in the front so it was more about who could go really deep. It was more of a classic finish than one for the pure climbers. It's cool to get in the breakaway at the Tour de France. It's only my second participation and my third breakaway. You always learn and in every breakaway you learn, so it was a good experience. I hope that one day I can make this experience work and pull a win off."